Marvel's Star Wars #18 kicks off the six part The Wheel saga. The story starts with Luke Skywalker going into a coma while he is performing a Jedi meditation aboard the Millennium Falcon. Han Solo decides to take Luke to The Wheel for medical attention. On the way to The Wheel, they discover an injured Rebel floating in space near a damaged House of Tagge merchant ship. The Rebel tells Han and Princess Leia that the merchant ship was carrying The Wheel profits and the Imperials are framing the Rebellion for attacking the ship. Imperial TIE Fighters attack the Falcon which races to The Wheel followed closely by the Imperials led by Commander Strom. The Falcon lands on The Wheel and our heroes split up. Han and Leia head for the upper levels hoping to lose themselves among the tourist who are on vacation gambling. Chewbacca takes the now dead Rebel with him and C-3PO and R2-D2 depart to take Luke to a medical facility. The Imperials board the space station and The Wheel administrator, Senator Greyshade, contacts Commander Strom to get an explanation for this intrusion. Strom explains that the Rebels attacked the ship carrying Wheel profits and he is in pursuit of those Rebels. Greyshade allows the Imperials to continue their activities as long as they keep it contained to the lower levels away from the tourists. The Imperial Stormtroopers are closing in on C-3PO, R2-D2, and an incapacitated Luke. The issue ends with Greyshade monitoring the Rebels from his quarters who recognizes Princess Leia. The Wheel saga is a fast-paced story packed with twists and cliffhanger endings which keeps the reader engaged. 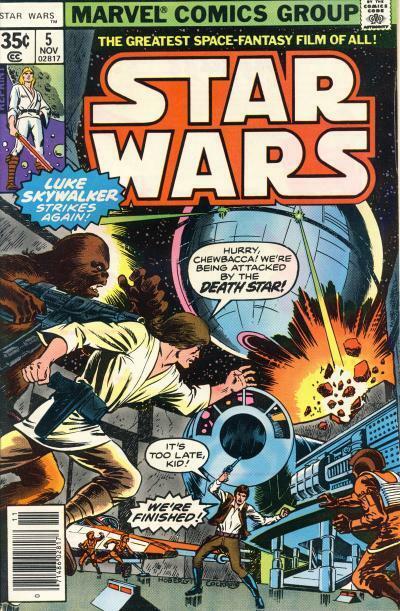 The cover to Star Wars #18 shows the scene where the Imperial Stormtroopers confront C-3PO and R2-D2 with Luke. It is a nice cover that captures the danger our heroes are in. 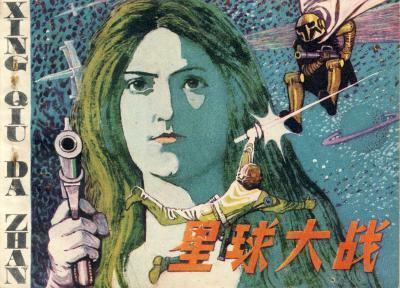 The cover to la Guerra de las Galaxias #9 published by Ediciones Vértice is the same scene redrawn. The Imperials are much closer to the droids on the cover to la Guerra de las Galaxias #9. Additionally, Luke looks more feminine. Carmine Infantino was not the most exact artist when it came to drawing characters and space ships, as is obvious on the cover to Star Wars #18, but it is easy to recognize what he was drawing. On the Spanish cover, C-3PO's head looks nothing like the character. 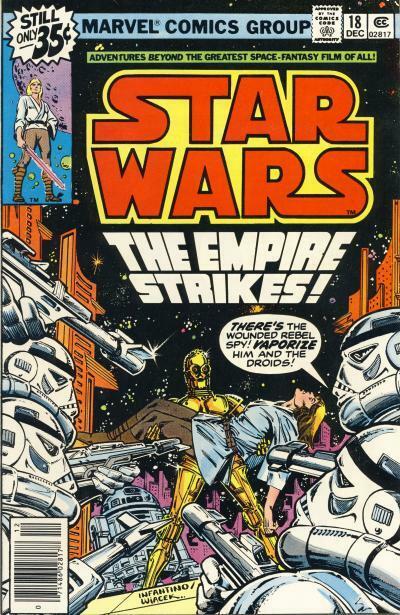 The artist references the stylized Stormtroopers drawn by Infantino, but it is unclear why C-3PO's face was not referenced. Both covers make it look like the scene is taking place in a city exposed to space. Inside the comic, this scene takes place in a corridor of The Wheel and space is not visible from the location. While I enjoy looking at the Spanish cover because of it's differences, the U.S. cover is the better cover. Drawing the Imperials closer to the droids does not increase the tension. 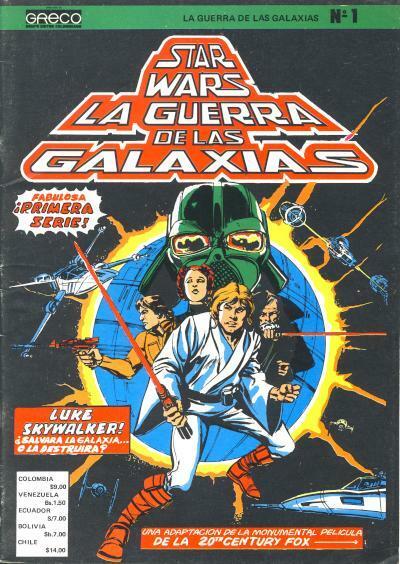 I do like the lack of word balloon on the cover to la Guerra de las Galaxias #9, but the title for the story "The Empire Strikes!" 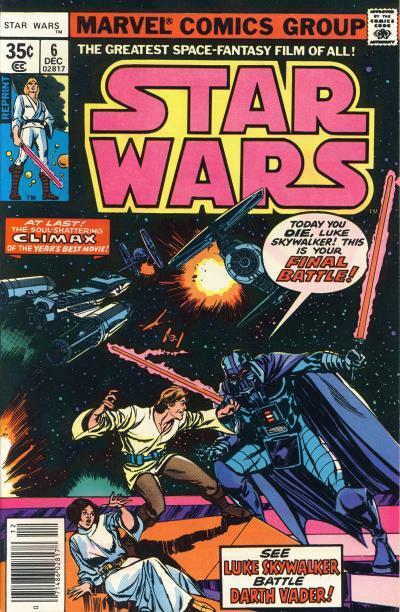 on the U.S. cover is cool because it is similar to the title The Empire Strikes Back, which was released almost 2 years after this issue was published. All 9 Ediciones Vértice published la Guerra de las Galaxias magazine-sized comics have art based on the U.S. covers. These redrawn covers only have minor changes from their U.S. counterparts and unless someone is familiar with the originals, it is easy enough to overlook the differences. 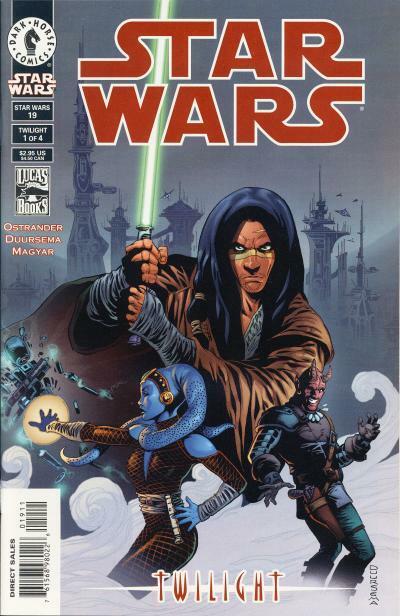 la Guerra de las Galaxias #4 which is based on Star Wars #7 is a good example of this. 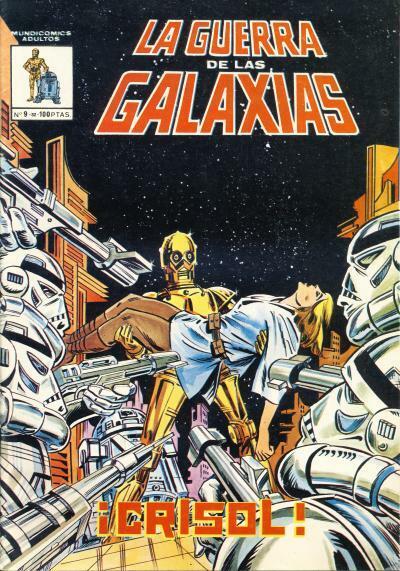 The cover to la Guerra de las Galaxias #4 can be the same scene shown on Star Wars #7 but just a few moments later. Han is still firing away but now his fist is clenched in determination to finish the fight. Chewbacca has dropped one foe and is now pointing out the danger to Han that is approaching. Chewbacca effortlessly hoists his second foe higher, as if he is about to toss him into the oncoming crowd. It is a very good redrawing of the original cover. The rendering of the planet in the sky is nicer and the color choices for the alien Chewbacca is holding are more realistic. Where the original cover is superior is in the choice of color used for the wrecked buildings in the background. 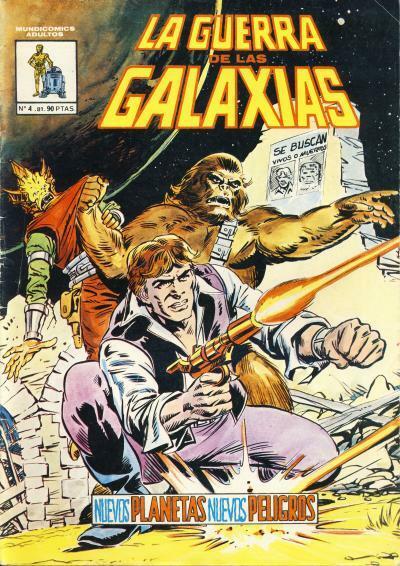 The grey on the original Marvel cover allow the characters to pop, whereas Han Solo is lost on the lighter yellowish backdrop on the Spanish cover. It is for this reason that I prefer the original cover. In an earlier post, I mentioned that Star Wars #13 (Vader Down part 3) was getting a 2nd print on 01/27/2016. Now it looks like it will be joined by other chapters in the Vader Down event. This means, so far, only Vader Down #1 has not had a second printing. Brazilian publisher Editora Abril acquired the license to publish the title O Incrivel Hulk in 1983. O Incrivel Hulk is a digest-sized anthology title which focuses on the Incredible Hulk for its 165 issue run. 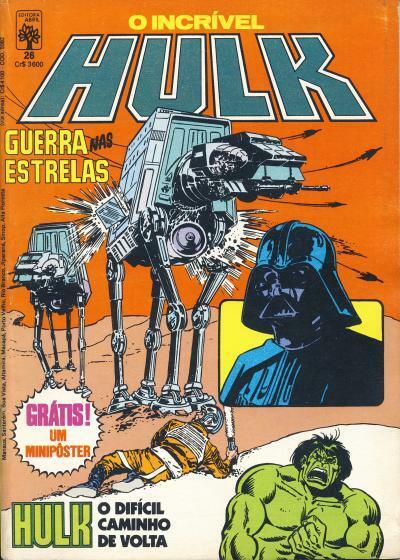 Marvel's Empire Strikes Back adaptation starts in O Incrivel Hulk #25 in August 1985 and concludes in O Incrivel Hulk #27. 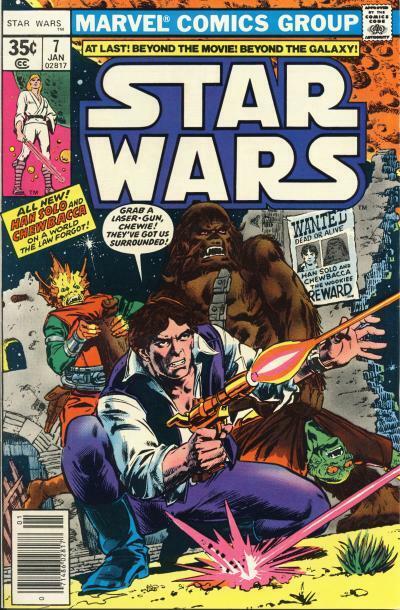 Other issues of this anthology title contain other Marvel Star Wars content, but not every issue. O Incrivel Hulk #26 has a different cover than any U.S. cover. The cover resembles the cover to Star Wars #40, but it is actually a combination of art found inside issue #41 with some unique elements added. 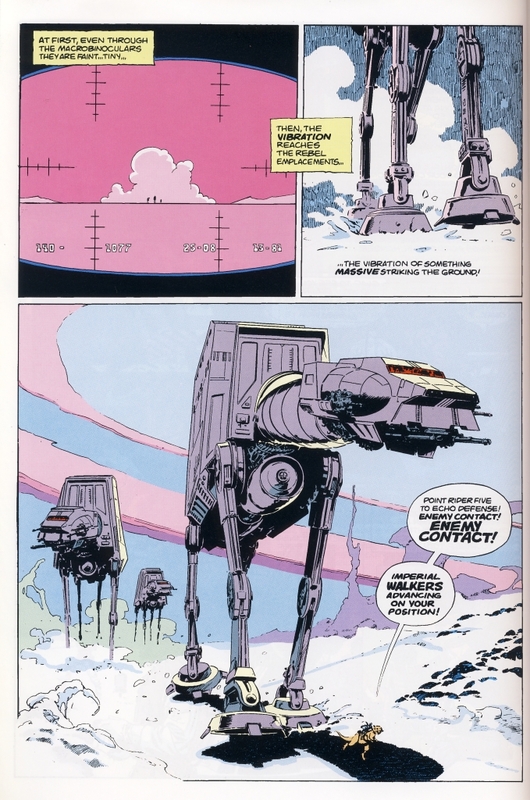 The AT-ATs are taken from the first panel in Star Wars #41 page 2. 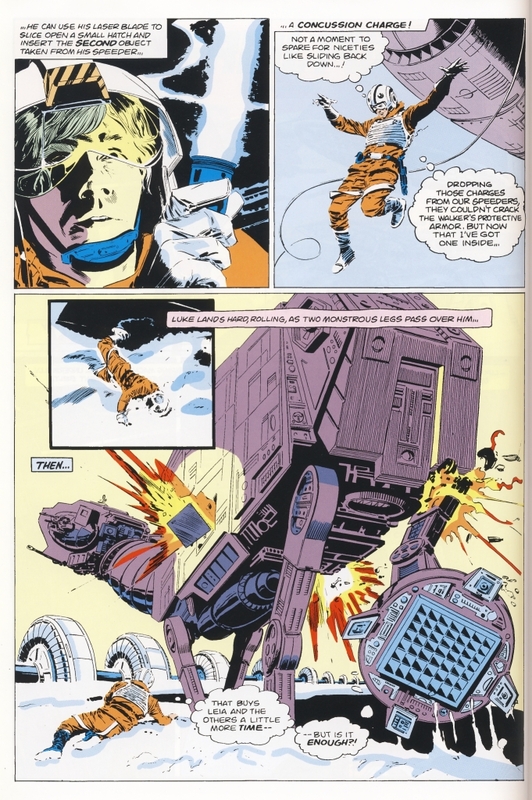 Luke Skywalker's body is taken from the last panel in Star Wars #41 page 4. Luke's head is taken from the last panel in Star Wars #41 page 8. 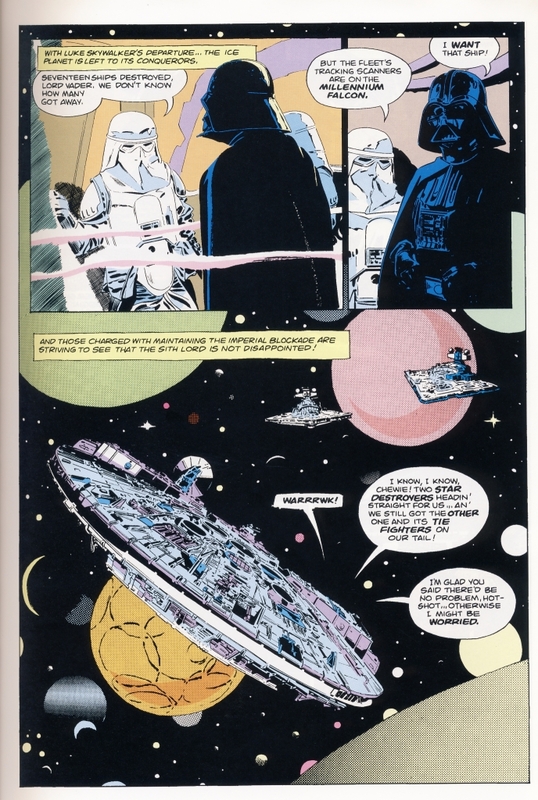 Finally, the image for Darth Vader in the inset is take from the second panel in Star Wars #41 page 9. While many of the images were borrowed from the interior pages, there are some unique elements on the cover. The AT-AT exploding from the inside is new. So are the many Snowspeeder silhouettes in the background. Finally, the lightsaber in Luke's hand appears to be a new addition as well. Obviously, the Hulk image at the bottom of the cover is taken from another title entirely. The orange sky is the same color used on the cover to Star Wars #40. It is fascinating whenever a foreign publisher chooses not to use cover art from U.S. issues. Interesting, Star Wars #40 page 10 has a drawing almost identical to that found in Star Wars #41 page 2. One of the nice things about both the Marvel Star Wars and Empire Strikes Back adaptations is they are spread over 6 issues. This gave plenty of room for the story to be told and not feel rushed. 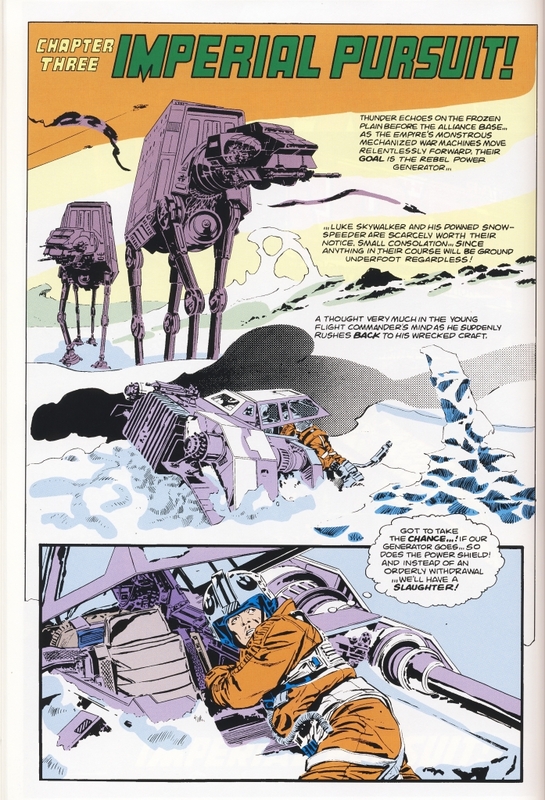 The AT-AT assault on Echo Base spans 11 pages which would not be possible if the Empire Strikes Back story was told in 4 issues. 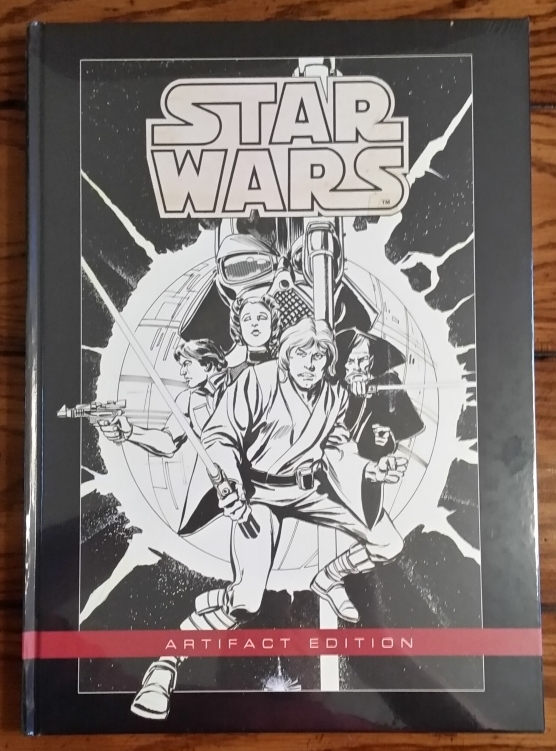 In December 2015, IDW published the Star Wars Artifact Edition hardcover. 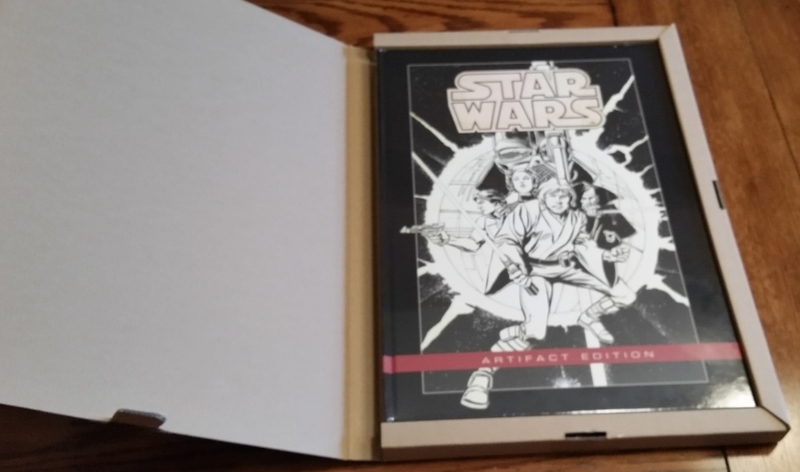 This 160 page book measures 12" x 17" and contains scans of original art for the first 10 issues of Marvel's 1977 Star Wars comics. Not every page of art is included, but just those pages that IDW has been able to track down and scan. I received my copy shortly after Christmas and am just now getting around to reading this large book. 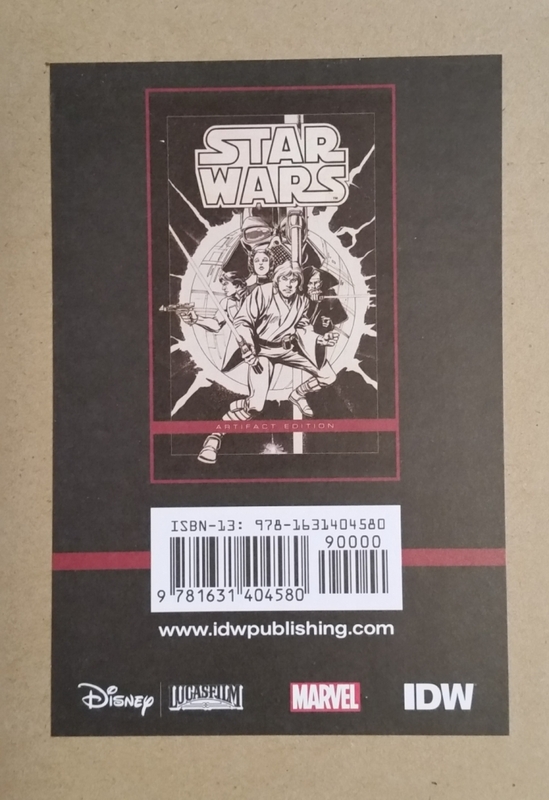 Like the Star Wars Micro Comic Collector Packs, IDW had to obtain the license from Marvel. The book is packed inside a box for protection. 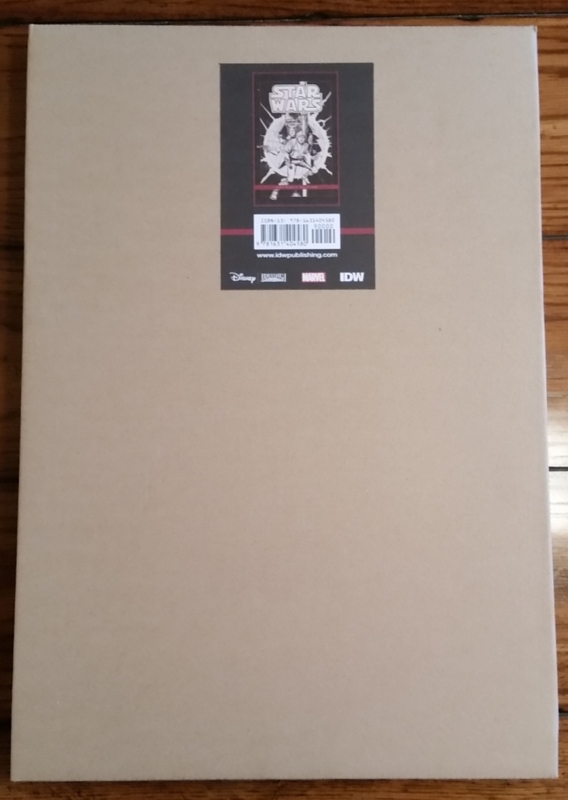 There is a label affixed to the box with the logo's of the companies involved: Disney, Lucasfilm, Marvel, and IDW. The box provides extra protection for the book except for the spine, which is presumably more durable. The reason the book is so massive is because the pages are printed at the same size as they were drawn. For a Star Wars comic fan, this book is a must have if you can afford it. The manufacturer suggested retail price is $100. 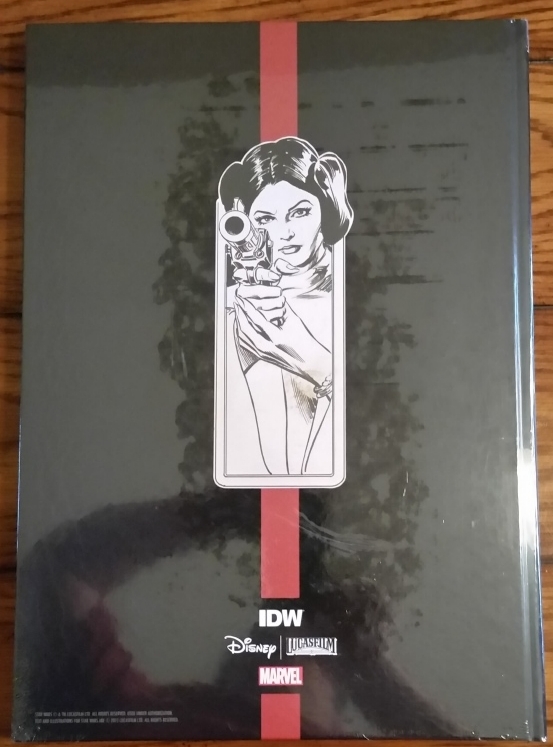 There are plans for IDW to publish several of these books and an Empire Strikes Back Artifact Edition has already been solicited. The Vader Down event that Marvel Comics has just finished publishing reminds me of a time when Darth Vader was not overexposed like he is today. It was inevitable that after his origin was shown in the prequels, the character would lose the mystery that helped make him such a great villain. It is hard to imagine today, but there was a time when Vader's appearance brought dread and his presence in books and comics was used sparingly to help propagate that sense of fear that something bad was going to happen when he showed up. This was used expertly in The Empire Strikes Back whenever Vader appeared on the screen; every scene with Vader was used to show just how powerful and evil he was. He intimidates and callously kills his subordinates, he cohorts with Bounty Hunters, and he has no problem cutting off the hand of his own son, the main hero of these movies, to show he means business. In fact, when the movie viewer learns that he has a master in the Emperor, Vader's evil is immediately transferred to that character. After all, if Darth Vader is this powerful and evil, the being he bows down to and calls master must be even worse! 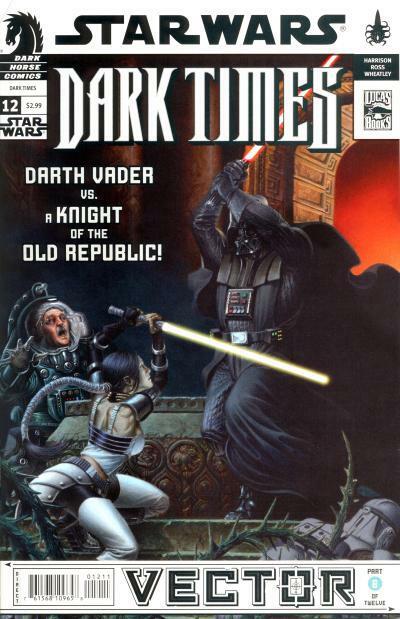 No one can blame Marvel for publishing an ongoing Darth Vader comic; Dark Horse Comics had done it first with several one-shots and a series of mini-series that focused on the character. One of the recipes for a successful Star Wars comic that Dark Horse learned was to feature the main heroes from the movies in the comic. 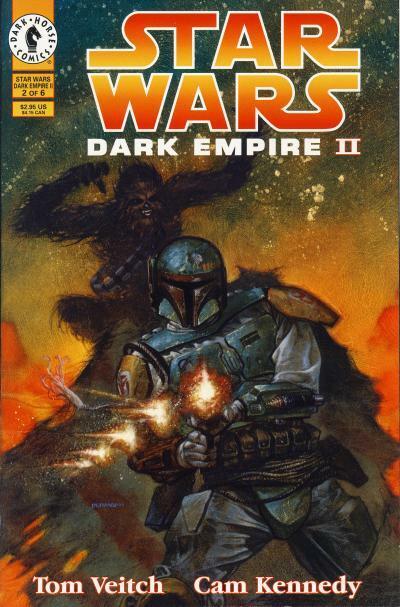 Dark Horse spent many years publishing comics and expanding the Star Wars universe, but it was those comics that featured the familiar heroes and villains of the movies that sold the best. 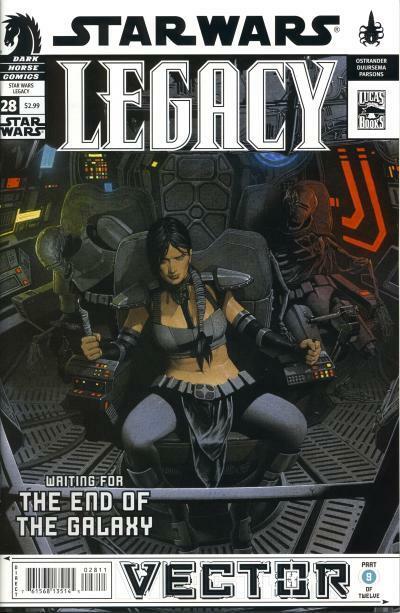 Marvel did not acquire the Star Wars license to squander the launch on lesser known characters and neither did Dark Horse when they published their first Star Wars comic, the mini-series Star Wars: Dark Empire in 1991. Admittedly, now that we know how the Star Wars story unfolds and are privy to details of Darth Vader's demise, the impact this villain has when interacting with our main heroes is lessened. 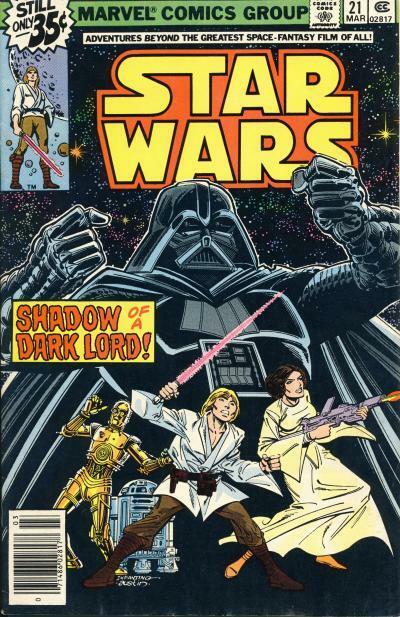 But that was not the case when Marvel published Star Wars #21 in a story titled Shadow of a Dark Lord. Pages 10 - 12 show Darth Vader leading a squad of Stormtroopers on the planet Ultaar. They are searching through the charred remains of a Rebel outpost and discover one Rebel who is barely alive. Vader interrogates the Rebel and learns that a cyborg named Valance has destroyed the base while searching for a boy and two droids. The rebel pleads for help to ease his pain and Darth Vader ignites his lightsaber and stabs the wounded Rebel, killing him instantly. Vader then contacts Captain Wermis on the Star Destroyer in orbit over Ultaar to find out what is at the coordinates where his mind touched another's. Wermis tells him it is empty space and Vader surmises the mind he touched was from a passing spaceship. The probable destination for the ship would be The Wheel and the destination for the Star Destroyer carrying Vader! This was a terrific re-introduction of Darth Vader to the Star Wars title and shows how effective this character is when used in moderation. It sets up an eventual showdown between Darth Vader and Valance The Bounty Hunter. Additionally, it increases the tension we already feel for our heroes on The Wheel. Darth Vader is a force of nature that cannot be stopped. He is so powerful and evil, his mind touching Luke's is enough to put Luke into a coma! The final pages of the comic increase the immediate stakes for our heroes and the story ends with Han Solo and Chewbacca in an zero-gravity arena filled with other contestants. The contest is a battle to the death and there can only be one winner. Between that and the coming of Darth Vader, how could you not want to read the next issue in this title! Modern zombies and the myriad of zombie-like creatures that are popular in fiction today can all trace their origins back to George A. Romero's 1968 Night of the Living Dead. That movie introduces the idea of a pack of slow moving, undead creatures that can swell their ranks with a simple bite. Derivatives of these early modern zombies have popped up in video games like Resident Evil, where the source of infection is a virus which can be transmitted through a bite, scratch, or even by ingesting contaminated water. The 2002 movie 28 Days Later takes this idea a step further where a Rage Virus creates a horde of fast moving, mindless, zombie-like creatures. The creatures in this movie are not dead however, whereas in the 2013 World War Z movie, a bite from a zombie can cause a person to die and be reborn in less than 15 seconds. In addition, these undead are fast moving like "the infected" from 28 Days Later and unlike the zombies in the book on which the movie is based. The popular video game series Halo has it's own version of zombie-like creatures in the form of The Flood. Comic book publishers, always eager to participate in popular trends, have helped propagate the popularity of zombie fiction. Marvel published the black and white magazine Tales of the Zombie to go along with their other monster heroes of the 1970s. Independent publishers kicked off the current zombie trend in comics however, when the popularity of zombies began surging in the late 1990s. This culminated in Robert Kirkman's 2002 The Walking Dead comic book which has slowly grown readership and has been adapted to a hit television series. The television series has helped drive even more readers to The Walking Dead comic, making it one of the best selling ongoing titles published today. This in turn has led to even more zombie comics being published by Independent publishers. In 2005, Marvel Zombies, a 5-issue mini-series, was published by Marvel Comics and proved to be extremely popular, blending zombie horror with superheroes. Not to be left out, DC Comics' imprint Vertigo published I, Zombie in 2010, starring a female zombie lead with a tone and supporting cast of characters not unlike that of Buffy the Vampire Slayer. I, Zombie has even spawned a television series of its own. Like most long lived Science Fiction series, Star Wars has tackled zombie fiction. Bantam Spectra published Galaxy of Fear: City of the Dead which features zombies. Zombies are also present in the Del Rey book Death Troopers and we see zombies created by the Nightsisters in The Clone Wars (2008) animated series. 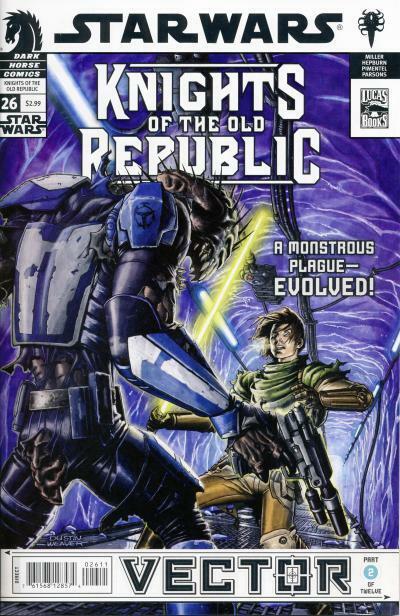 Another zombie-like creature in the Star Wars Expanded Universe is the Rakghoul. Rakghouls are a Dark Side creation of the Sith Lord Karness Muur who engineered a talisman for this endeavor. Rakghouls, while not zombies in the traditional sense, exhibit some of the same characteristics of a modern zombie; they tend to gather in packs and spread the Rakghoul plague by biting or scratching. Unlike zombies, Rakghouls can also be created using the talisman, which also gives the wielder the ability to control the mutant horde. A side effect of the Muur Talisman however is the owner is haunted by the constant presence of the spirit of Karness Muur. The Jedi Master Celeste Morne was tasked with finding this Sith artifact for the Jedi and fell under it's spell. The story of Karness Muur, Rakghouls, and Celeste Morne are chronicled in the Dark Horse event called Star Wars: Vector. 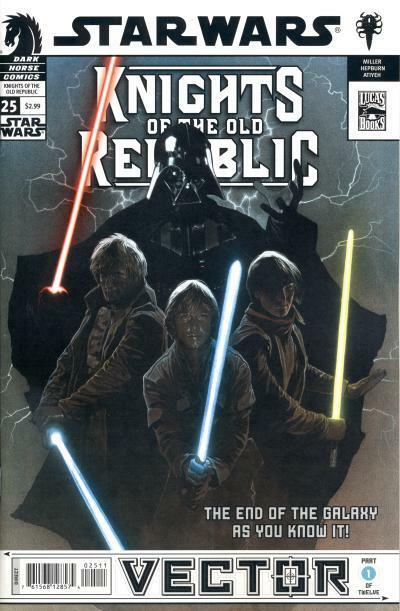 This 12-part story ran through all four ongoing Dark Horse Star Wars titles in 2008. This story spans over 4000 years, taking Celeste Morne and the spirit infested Muur Talisman from the Knights of the Old Republic era to the Dark Times era to the Rebellion era and finally to the Legacy era. USA Today is reporting that Poe Dameron, the Resistance's best pilot, is going to star in his own ongoing comic in April 2016. The series will take place prior to the events in The Force Awakens movie and will introduce a new enemy from the ranks of the First Order for Poe to battle with. Please read the post Exclusive: 'Star Wars: Poe Dameron' comic book debuts in April. 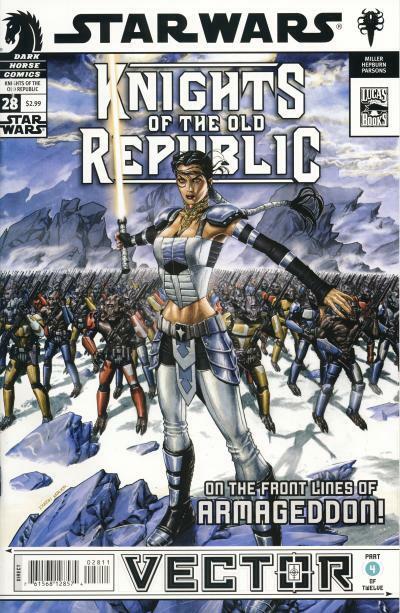 With the introduction of a new era in The Phantom Menace, Dark Horse Comics embraced this period where "the Jedi Knights were the guardians of peace and justice in the Old Republic" and created several new Jedi characters to use alongside their movie counterparts in the main Star Wars (1998) title. 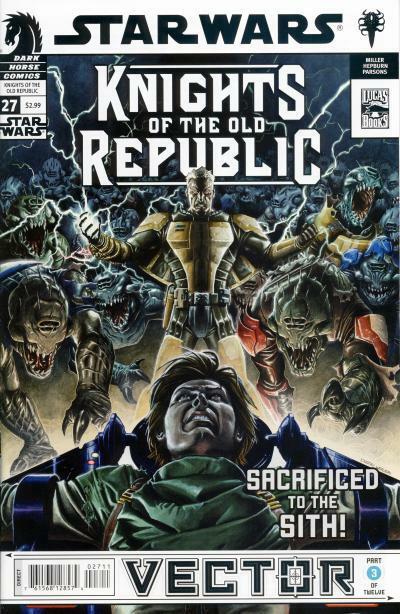 The first several years of that title are especially fruitful as Dark Horse introduces: A'Sharad Hett - a male Human Jedi Knight that is raised among the Tusken Raiders on Tatooine and will eventually terrorize the galaxy as Darth Krayt a few generations later in the Star Wars: Legacy title; Quinlan Vos - a male Jedi Knight that carefully treads close to the Dark Side and will, more or less, become the main character in many of the stories told in the Star Wars title and later the Star Wars: Republic title; and Aayla Secura - the blue female Twi'lek Jedi apprentice of Quinlan Vos and another recurring character in the Star Wars and Star Wars: Republic titles. 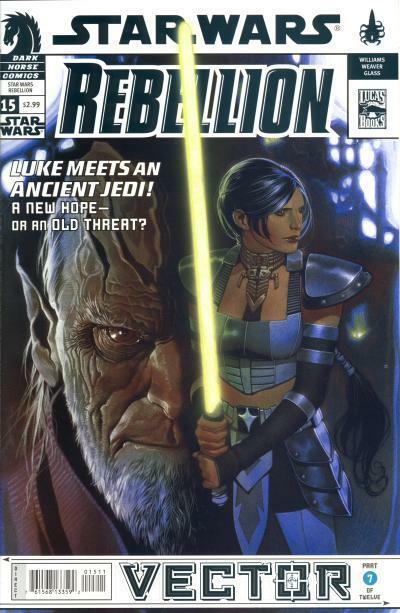 The first appearance of Aayla Secura is in Star Wars (1998) #19. Aayla Secura is the only Star Wars character to successfully make the transition from comic books to the big screen. George Lucas liked the Dark Horse character and wrote her into the Attack of the Clones. Promoted to Jedi Knight prior to the start of the Clone Wars, Aayla is one of many Jedi who fought in the Battle of Geonosis. As a Jedi Master, she is killed by her troops carrying out Order 66 on Felucia in Revenge of the Sith. It is only natural that Aayla Secura appears several times in the Clone Wars TV shows. She is in two episodes of the Star Wars: Clone Wars (2003) series where she is with a group of Jedi who confronted General Grievous. Aayla is also used in several episodes of the Star Wars: The Clone Wars (2008) series. The Comics Chronicles released the December estimated sales today . Despite another onslaught of new Marvel superhero #1s, the Star Wars titles held strong and 4 issues placed in the top 10 for the month. In November, we saw Darth Vader #13, part 2 in the Vader Down event, sell over 23,000 more copies than Darth Vader #12. In December, both the Star Wars and Darth Vader titles tie into the 6-issue event. Star Wars gained approximately 16,000 copies and Darth Vader lost about 16,000 copies, make it a wash for the month. Star Wars is still the top selling ongoing title in December. In recent years, Marvel has made the attempt to have their annuals count by having the story relate back to the main title. This has paid off for the Star Wars and Darth Vader Annuals, both of which placed in the top 10 titles in December. This is even more remarkable when you consider they outsold the first issues of the All New X-Men, Deadpool, Totally Awesome Hulk, Spidey, and All New Inhumans. The last issue of the Chewbacca mini-series fell just under 5,000 copies. Every issue in this mini-series still placed in the top 50 titles every month, so Marvel has to be pleased with that. Kanan shed just under 2,000 copies a slightly higher drop than last month. This title is due to end with Kanan #12. The average sale per issue would rank 12th on the top 300 chart for the month of December. The 6 Star Wars issues this month sold almost half as many units as the 8 Star Wars issues from last month. Take a look at the Star Wars Sales Estimate Chart and please read the blog posting December 2015 comics sales estimates online: Secret Wars #8 leads with 170k copies ordered. Retro Marvel: Star Wars #5 and 6 Newsstand Reprints - These aren't the droids you're looking for. A few years back, I decided I wanted to complete my U.S. Star Wars comic collection, including the direct and newsstand editions of every issue as well as the various reprints for the first six issues. I knew that the $0.35 test market variants for Star Wars #1 - 4 were too expensive, so I would have to do without those 4 issues. (Maybe someday I will add them to my collection, but for now, I am content pursuing the foreign books I need.) I figured it would be easy enough to fill in the holes in my collection since Marvel Star Wars issues are fairly common. As I purchased nice copies of the missing issues in my collection, I found two comics to be elusive in any condition, the Star Wars #5 and 6 newsstand reprints. To put this into perspective, if I wanted to spend the money, I could purchase the Star Wars #1 - 4 $0.35 test market variants and it would take me a month or less to find decent copies. They are consistently listed on eBay. But what I was discovering with the Star Wars #5 and 6 newsstand reprints is they were not readily available on eBay in any condition. How could this be? I remember searching both the My Comic Shop and Mile High Comics websites with no luck. Desperately, I sent email to every Amazon seller who had a Star Wars #5 or 6 listed and asked if it was a newsstand reprint. I came up empty handed and I confused more than one seller trying to describe the issue. I remembered there was a comic dealer in Canada who specialized in rare and unusual comics, Doug Sulipa. Years ago, I used him to track down some Whitman comics I needed. His prices are somewhat high, but if anyone had these issues, I knew it would be him! I search his website with no luck so I decided to send him email asking about these two comics. He replied he did not have these two issues in stock. I thanked him and asked him to let me know if he ever received any, noting my eagerness to find copies. That was about two years ago and I never heard back from him. Locally, I began to ask around for these comics. I ran into Tom Kalb at a comic show and asked him about them. When I was a kid, Tom had boxes and boxes of Star Wars comics in his shop in Mesa, Arizona and he still has tons of Star Wars comics which he now lists on eBay. He did not have copies. I did eventually find copies of the Star Wars #5 and 6 newsstand reprints for my collection, but not without a long wait. I decided I wanted to add a few more of these elusive issues to my collection and began searching eBay listings for these two comics about a year ago. (Interestingly enough, I found copies of the Alemar's Star Wars #1 and 2 on eBay while looking for these two reprints.) So, for the better part of a year, I watched eBay listings waiting for these two comics to come up for sale. In that time, I was able to acquire a few copies, but it was about 1 issue every 2 - 3 months. Every other Star Wars comic, reprint or otherwise, is listed on eBay all the time, usually multiple copies, even the "hard to find" later newsstand issues. Star Wars #1 - 4 newsstand reprints are common, but #5 and 6 are not. I suspect this has to do with newsstand sellers knowing by the 5th issue how many Star Wars comics they could sell and ordered the 1st prints accordingly, so the need for reprints of those two issues was greatly diminished. I realize these two comics are reprints and will never command the kind of money that a $0.35 test market issue does. We know those test market issues were limited to 1,500 copies and were only distributed in a few cities across the U.S. I have my suspicions there are significantly more of these Star Wars #5 and 6 newsstand reprints than these test market comics despite my inability to turn up many copies and the reason the test market issues seem more common has to do with how liquid those variants are. There is no demand for the Star Wars movie adaption reprint issues, so why list them on eBay when they sell for so little? To be fair, most of the reprints of Star Wars #1 - 6 are common, probably just as common as the 1st printings. It may yet turn out that Star Wars #5 and 6 newsstand reprints are common too. But for now, that has not been my experience. The Comics Chronicles released the November estimated sales a few weeks back. With the help of Vader Down #1, the Star Wars titles sold over 1 million comics in November, the best month ever. Vader Down #1 is the 2nd best selling modern Star Wars issue behind Star Wars #1. It took 2nd place behind Dark Knight III: Master Race #1. While Marvel did not publish as many incentive and exclusive covers for Vader Down #1 as they did for Star Wars #1, there are still more of them than the standard issue. (My last count showed there were 36 different covers.) Earlier, Marvel announced Vader Down #1 sold over 450,000 copies, so I am not sure where the nearly 70,000 copy discrepancy is between what Marvel reported and what The Comics Chronicles calculated. Maybe we will see next month. This event carries over into Darth Vader #13, also out this month, which saw a 25.95% increase over Darth Vader #12. 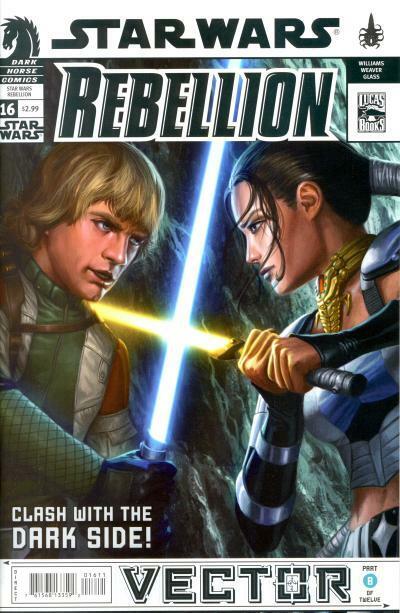 Undoubtedly, Star Wars #13 will see a similar rise next month. This 6-issue event runs through Darth Vader #13 - 15 and Star Wars #13 and 14 and I expect these event issues to sell better than the last non-event issue of each title. Both Star Wars and Darth Vader shipped 2 issues in November. Star Wars #11 and 12 saw a modest drop in sales. Darth Vader #12 also saw a modest drop and as mentioned above, Darth Vader #13 was up over 23,000 copies. This month is the closest sales have been between the Star Wars and Darth Vader titles since their inception. If you look at the top 300 comics for November, Star Wars #11 was the top selling issue in an ongoing title that is not a #1. Uncanny X-Men #600 took the 8th spot on the chart, edging out Star Wars #12. Not counting Uncanny X-Men #600, Darth Vader #13 was the second best selling issue in an ongoing title that is not a #1. Both titles, almost a year after they began, are showing the same kind of longevity seen by DC's Batman title. Chewbacca #4, with 58,051 copies, is now the lowest selling issue in a Star Wars mini-series, besting Lando #5 which sold 59,760 copies. I expect Chewbacca #5 to sell less than #4. The next mini-series is Obi-wan and Anakin. It will be interesting to see if it reverses the trend of each new mini-series selling less than the previous mini-series. Kanan shed a modest 1,303 issues this month with 42,824 copies sold. Marvel has already announce that Kanan #12 will be the final issue in this title. This might be understandable since the Star Wars mini-series have been outselling this ongoing title. Whether or not Marvel replaces Kanan with another ongoing title or just adds another mini-series to the mix every month is unknown. I suspect Marvel will be seeking a higher profile character or sub-brand for the next ongoing if that is the direction they go. Here is a table with the number of Star Wars issues sold per month since January 2015 along with the average number of sales per issue. Note this chart does not include reprints of which there were several in the month of November. The average sale per issue would rank 9th on the top 300 chart for the month of November. The 8 Star Wars issues alone account for roughly 1 out of every 8.3 top 300 comics sold! When comparing Marvel and DC's market shares, this cannot be discounted as these titles account for 12% of Marvel's top 300 sales. Take a look at the Star Wars Sales Estimate Chart and please read the blog posting Comichron November 2015 comics sales estimates online: Dark Knight III tops 440,000 copies. Star Wars #13, the 3rd part in the 6 part Vader Down event, will get a 2nd print on 01/27/2016. Celebrating day twelve of the 12 days of Boba Fett covers! Hopefully you will agree, I saved the best for last. 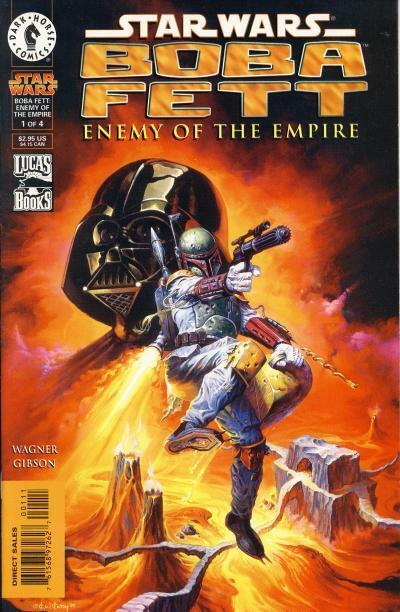 In 1999, Dark Horse hired Ken Kelly to provide cover artwork for the mini-series Star Wars: Boba Fett - Enemy of the Empire. Ken Kelly is a fantasy artist who studied under his famous uncle Frank Frazetta. Probably Ken's most famous piece of art is the cover to KISS' fourth album, Destroyer, released on March 15, 1976. In addition to the KISS album cover, he also created covers for Conan paperbacks for DAW books; covers for Eerie, Creepy, and Vampirella magazines for Warren Publishing; and artwork for Mego's Micronauts toy line. His covers for Dark Horse are among the best covers produced for Star Wars comics. 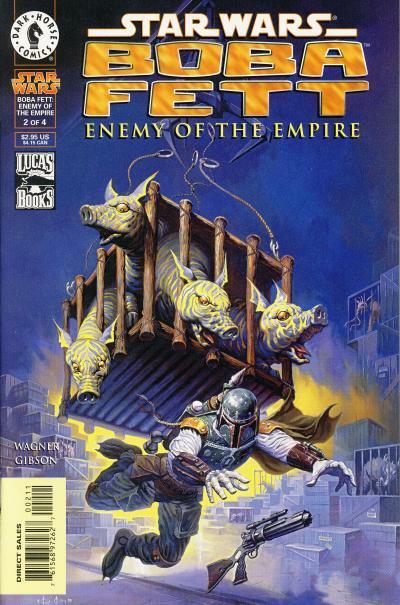 In addition to providing cover artwork for the Boba Fett - Enemy of the Empire mini-series, Ken also did the cover work for the first 12 issues of Dark Horse's 1998 Star Wars title. 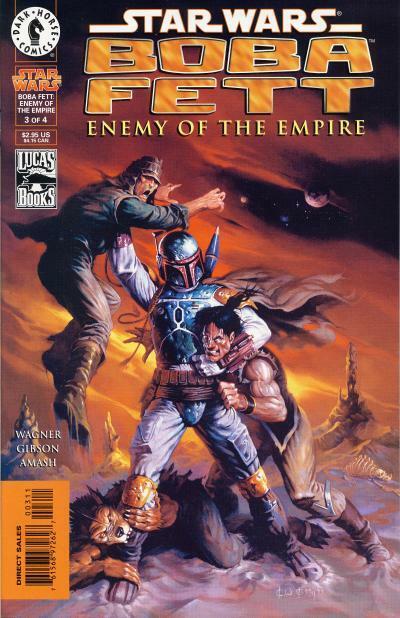 Boba Fett - Enemy of the Empire chronicles the first meeting of Boba Fett and Darth Vader in the Expanded Universe. 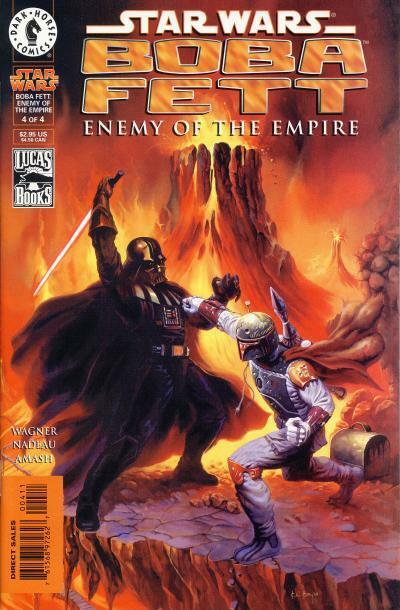 Taking place before the original trilogy, Vader contracts Fett's services and by the story's end, there is a battle between these two characters. The painted cover to issue #1 is gorgeous with a bluish Boba Fett juxtaposed against a red and black background. The cover to issue #2 is the weakest of the series, but it is still a standout when looking at the entirety of Boba Fett comic covers available. 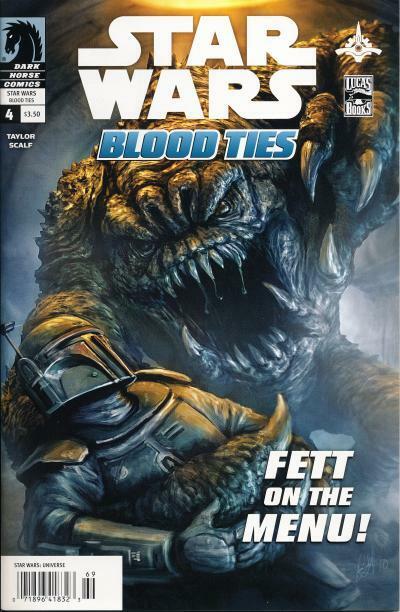 Issue #3 shows Boba Fett fighting off three attackers on an alien landscape. Out of the four covers in this series, this artwork feels the most like it should adorn a paperback about our favorite bounty hunter. The last cover recalls the first cover in this series, using the same color palette. It is a beautiful cover worthy of a match-up between these two fan favorite characters. 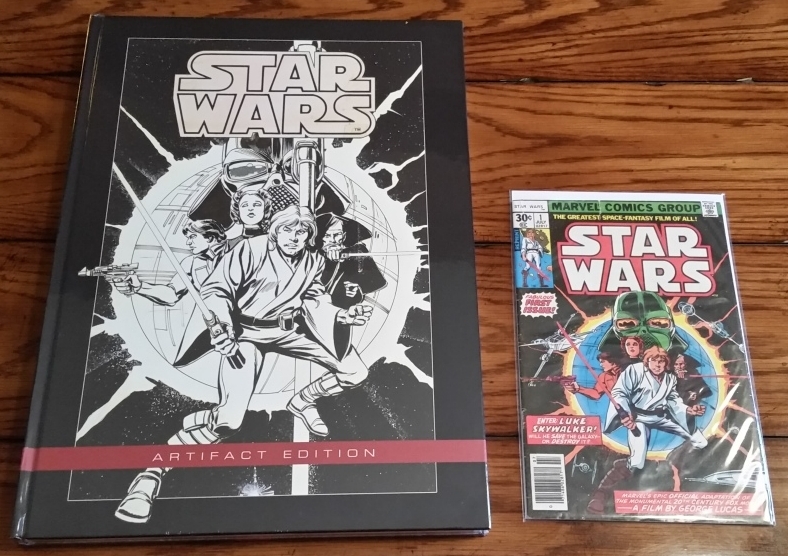 Not only do collectors get a mini-series with a cool story line, but the two covers that bookend this series makes it a must for Star Wars comic collectors. Celebrating day eleven of the 12 days of Boba Fett covers! The latest Chinese Star Wars lianhuanhua added to my collection is the issue that received all the press in 2014 when Maggie Greene published the blog A Long Time Ago in a China Far, Far Away ... This lianhuanhua was also translated by Nick Stember and I highly recommend you take a look. I've showcased these Chinese treasures in earlier blogs, but it is important to note this is the oldest published Star Wars lianhuanhua. All through the adaptation, several characters from the Empire Strikes Back are shown: Boba Fett, 2-1B, IG-88, and Bossk. Imperial Stormtroopers are clad in the same armor as Boba Fett. Imperial officers wear armor that look like 2-1B, the surgical droid that oversaw Luke Skywalker's care after his run in with the Wampa on Hoth. IG-88 and Bossk also serve a role in the Imperial military. This comic is a wildly imaginative visual treat for fans of Star Wars. Using the Boba Fett design in the role of an Imperial Stormtrooper is actually poetic. The original Fett armor was white since it was design for Imperial "super troopers". Later on, as the Empire Strikes Back script progressed, Fett was turned into a bounty hunter and the color scheme for the armor changed. Celebrating day ten of the 12 days of Boba Fett covers! Boba Fett has a small role in Star Wars: Dark Empire. His appearance is foreshadowed when a derelict ship that looks like the Slave I is shown in orbit around the moon Nar Shaddaa when the Millennium Falcon arrives with Han Solo, Princess Leia, Chewbacca, and C-3PO aboard. They are there to get help traveling to the planet Byss, the center of the rejuvenated Imperial controlled space and the location of Luke Skywalker. Han Solo is betrayed by one of his contacts, Mako, when Boba Fett, Dengar, and a few new bounty hunters show up to capture him. Han has a bounty on him for the death of Jabba. Our heroes, receiving help from Han's old girlfriend Salla Zend and friend Shug Ninx, escape the bounty hunters who give chase aboard Slave II. The Slave II is severely damaged by security shields when approaching the planet Byss following the Falcon. 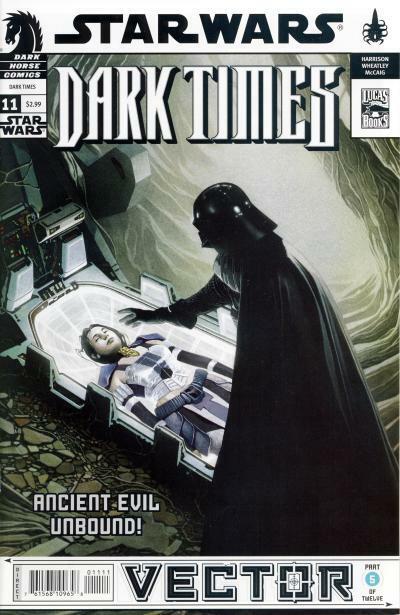 While IG-88 is shown on the cover to Dark Empire #4, he does not actually appear in the story. The ship shown above the bounty hunter trio is the Slave II. Boba Fett's appearance in Star Wars: Dark Empire II is also brief, but some of his backstory is revealed. He also appears on two covers which coincide with his use in the story. On Nar Shaddaa, Boba Fett is approached by two Imperial dark-side warriors. They tell Fett he is to work for the Empire for no pay or they will divulge that Fett was an Imperial Stormtrooper who murdered his superior officer. Fett attacks the dark-side warriors and escapes aboard Slave I. Meanwhile, the Millennium Falcon with Han, Leia, Chewbacca, Salla, and Shug returns to Nar Shaddaa so Leia can find an old female Jedi named Vima Da-Boda. They are attacked by the Imperials and Han, Leia, and Chewbacca board the Falcon and are subsequently attacked by Slave I piloted by Fett. They escape and resume their search for Vima. When they find Vima, Boba Fett attacks them again. This time, Chewbacca rips Fett's helmet off and ignites Fett's rockets which send him careening into the ceiling. It is interesting to note that Chewbacca is shot by Boba Fett in this sequence, not unlike him getting shot in The Force Awakens. "Once again Boba Fett underestimates Han Solo's abilities... and his luck! With all its systems shorted out and its new reactor at critical mass, Slave I spins out of control into the radioactive gas cloud." 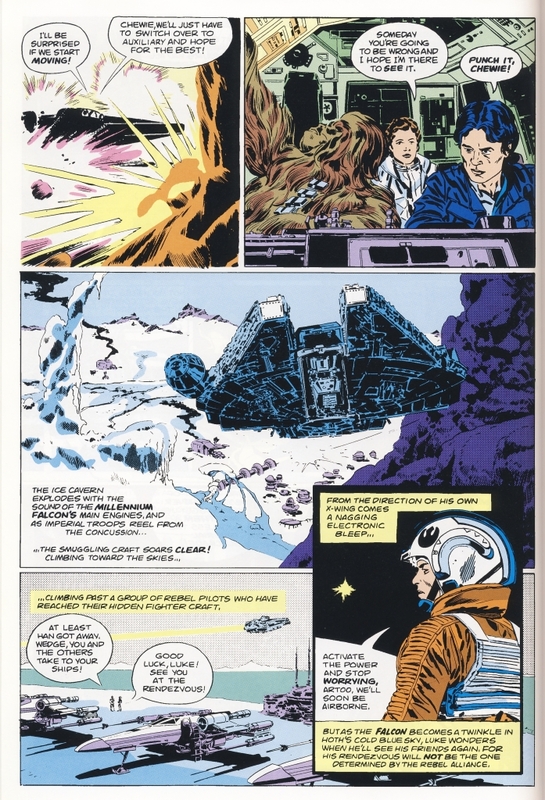 The next panel shows Leia and Han at the controls of the Falcon and Han Solo exclaims, "Didja see that flash? I got a feelin' we'll never see him again! I'm gonna miss him. Where to, Leia?" 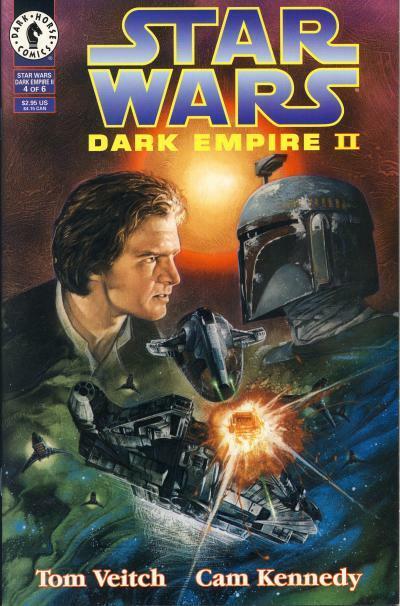 The cover to Dark Empire II #4 shows the standoff between Han Solo and Boba Fett. The Falcon, emerging from the gas cloud, is pursued by ships as Slave I intercepts it. It is a terrific cover showing Han Solo's resolve to defeat Fett once and for all. It is clear from the text that Boba Fett was meant to die in Dark Empire II. Boba Fett does not appear in Star Wars: Empire's End, the third and final story in the Dark Empire trilogy. Boba Fett is not dead however; he shows up in future stories that take place after Dark Empire II in the Expanded Universe. It is a trope of comic books that if a body is not shown, the character is not dead. Celebrating day nine of the 12 days of Boba Fett covers! 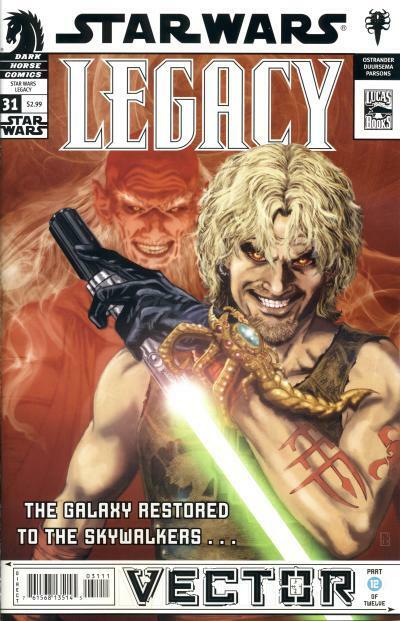 Cam Kennedy is best known by Star Wars comic fans for his art on Star Wars: Dark Empire and Star Wars: Dark Empire II. His next comic after Dark Empire II is Star Wars: Boba Fett - Bounty on Bar-Kooda which kicked off 3 interrelated Boba Fett one-shots he drew with John Wagner providing the story. The second Boba Fett one-shot is called Star Wars: Boba Fett - When the Fat Lady Swings and the final one-shot is Star Wars: Boba Fett - Murder Most Foul. 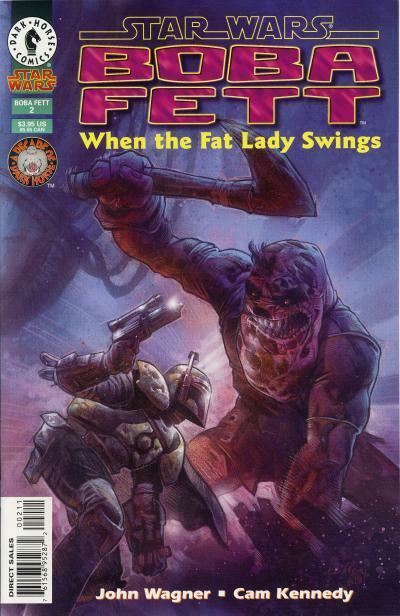 The cover to Boba Fett - When the Fat Lady Swings shows Boba Fett battling Ry-Kooda, the older brother of Bar-Kooda, Fett's target in the first one-shot, Boba Fett - Bounty on Bar-Kooda. In the story, a Hutt named Anachro is kidnapped and held for ransom. Her husband, another Hutt named Gorga, hires Boba Fett to free his wife. The kidnappers contact Gorga and leave instructions on how to pay the ransom with the threat "Any tricks and the fat lady swings." which is the source of the title for this comic. Celebrating day eight of the 12 days of Boba Fett covers! 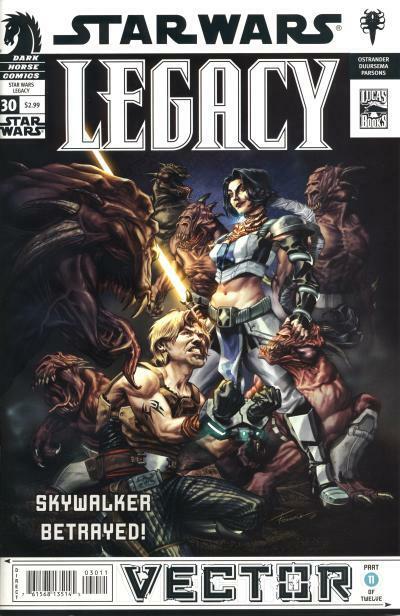 Not all Star Wars comics published by Dark Horse were distributed through the newsstand. 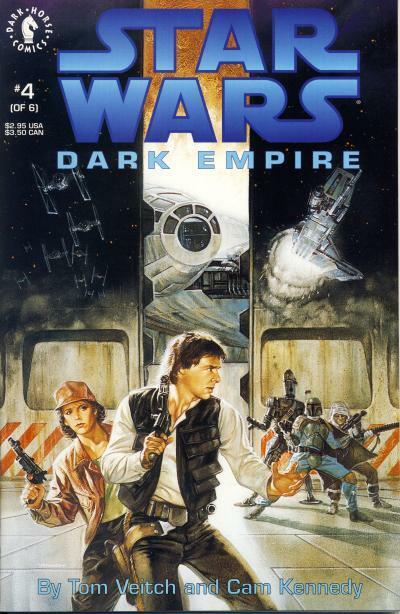 Early titles like Star Wars: Dark Empire, Classic Star Wars, and Star Wars: Tales of the Jedi were only distributed through comic specialty stores, but by the mid 1990s, most new Star Wars title did get newsstand distribution. 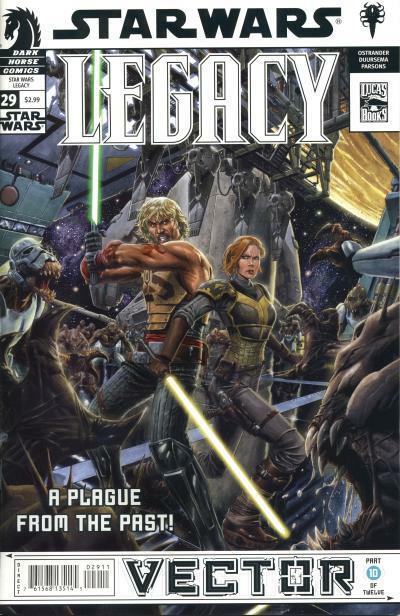 Dark Horse stopped newsstand distribution around the time they published their last Star Wars comic in the fall of 2014. I suspect the loss of the Star Wars license prompted this decision. In early 2015, they did resume a program with the Books-a-Million bookstore chain for select titles. As far as I know, there is no other discernible difference between a Dark Horse newsstand and direct edition comic besides the UPC box. Published in August 2010, Star Wars: Blood Ties #4 was published with a newsstand and direct version. The direct edition says "Direct Sales" in the UPC box. The newsstand edition says "Star Wars: Universe" in the UPC box. The cover shows Boba Fett in the clutches of a Rancor!